To be in with the chance of winning a Marks and Spencer hamper worth £150, simply email your favourite Christmas memory to competition@cosyfeet.com by 11.59pm on Monday 18th December 2017. We will select our favourite from the entries. All competition entries will be added to our email mailing list. By submitting an entry into our competition, you are consenting to us using your name on our website and in future newsletters. We reserve the right to withdraw this competition at any time. 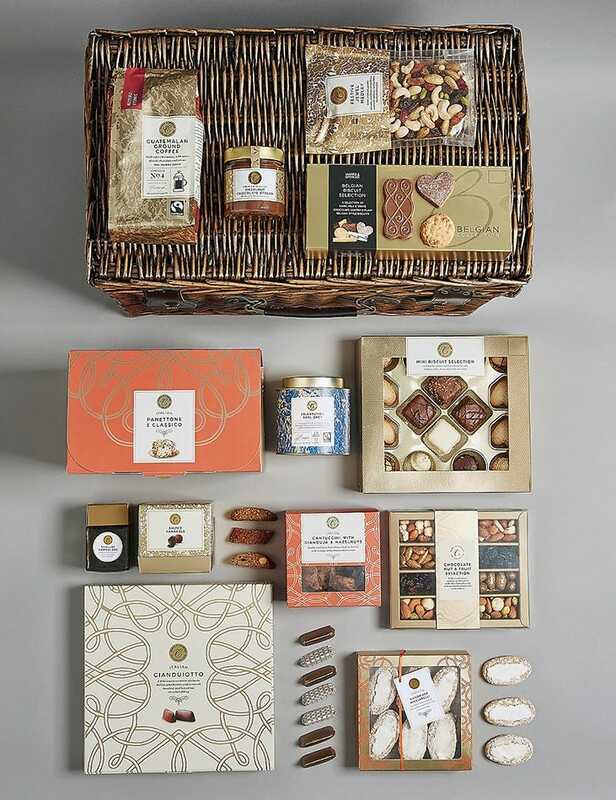 Please note: Unfortunately, due to stock availability the hamper has changed from the one originally shown. My favourite Christmas memory is taking my four grandchildren to see Father Christmas together for the first time. Not for publication, two are adopted and that first Christmas together was magical. My older Sister convincing myself and my younger Brother that she could hear the bells of Santas reindeer. Dad making us bacon and mushroom sandwiches for breakfast. Mum and Dad in hysterics as they tried to quietly bring in our paper sacks full of presents on Christmas Eve. My sister taking ages on Christmas morning in the bathroom using her new toiletries. Such happy magical memories. 1982 Sitting down with my three brothers, mum, dad and granddad for Christmas dinner because that was my granddad's last one before he died in the January. M & S is a sure success. My Christmas memory was when my late Dad gave me a wooden jeep he had made for me. At 73 years old the same memory comes back to me every year. It starts in the 1950s Christmas eve. Back in our modest council house in Bolton, Mam Dad my two sisters Barbara and Shirley.Dad and I buy the turkey from the Bolton Market, Mam and my sisters prepare the house for Christmas, Crepe paper decoration streamers, Balloons,the tree, mistletoe. Dad and I cook the turkey. sing carols, go to bed excited, cant sleep. Christmas morning Santa has left us toys. Our stocking hanging from the fireplace , Apple and Orange, Nuts in Shells, Silver half crown. So simple but the happiest days of our lives. God bless Mam and dad. Christmas memory - is walking to Midnight Mass in the snow when I was 6 or 7 - it was Crisp under foot, midnight dark sky, with a clear moon and then soft falling snow, so cold you could see your breath and my sister lent me her home made warm nurses cap to put on over my coat - a wonderful walk and filled with family love a very special Christmas Eve. Watching my kids open their pressies together on christmas morning,and their faces light up with their delight! In the early 1950's, I must have been about 7,mam and dad taking us in the car (have always remembered that car no, JUP783 Austin A40,) for the Christmas tree, always stopped for a glass of pop, one year I somehow bit the glass it broke, didn't hurt myself but after that year we never stopped for pop. little mishaps like this always seem to be remembered for life. Coming down on Christmas morning as a child to smell of Turkey and our stockings had shiny coins tangerines and nuts in. Then the sixpences in my Christmas pudding. My favourite Christmas memory is of the first Christmas that my husband and I spent together alone. This may sound selfish, but we'd had a very difficult few years, with his father, who lived with us, slowly deteriorating, & finally passing away. My children were married & with their own families - our bungalow was too small to accommodate them all. So - just the two of us - bliss! Playing in the snow with my children on Boxing Day when they were very young. It was the first time they had seen thick snow and been able to make a proper snowman. My fondest memory of Christmas is sleigh rides down death hill with all my friends and seeing who would be on the shallow pond ice when it cracked. Thank you CosyFeet for a brilliant website offering affordable products & solutions for all foot & leg care problems. On Christmas day when we went round to my mums house and all the family came round me my 2 sisters and my brother we played games at night sadly they have all passed away so Christmas will not be the same again but i will spend with my lovely husband and my 2 sons and try and have a nice time thinking about my late family. Seeing the Christmas themed displays made by Clarks shopfitting department that were on show outside the Greenbank pool or Clarks HG through the 1960's to mid 90s and now been revived. After Christmas dinner I took the parsons nose from the turkey to my lovely great aunt who lived in a care home. It was a delight to see her happiness - she loved it. Listening to our children sneaking downstairs on Christmas morning to check that Santa had visited during the night. Favourite memories were when my children were tiny and Christmas was magical and exciting for them. When the angel on top of our christmas tree winked at me age 7, absolutely magical, and the reason I have a star on mine aged 48!! Sitting down to watch the Snowman on TV for the first time. It was magical then and it still is now. Christmas isn't Christmas without it. Watching everyones faces light up as the christmas lights are switched on. epic. My favourite Christmas memory is my first Christmas in our home as a couple. We could eat what we want drink what we want and wear our pj's all day whilst watching rubbish tv. When I got married it was almost Xmas day - the whole fortnight after was really magical to me and my Husband!! We've never forgotten it!! When my little girl saw the space station fly over on Xmas eve, she screamed in excitement! Having my two children home with me. 1954 - woke my parents up at 3am on Christmas morning riding my new scooter up and down the hall. They were not amused!! My favourite memory has to be when me and my brother used to have sleepovers the night before christmas when we were young. We would barely sleep and just talk and talk! Memories of a Salvation Army band marching out before daybreak on Xmas morning to the sound of "Christians Awake". Dogs barking, people coming out of their homes to march with the band to the nearest street corner for a Xmas morning service. Memories of my native country British Guiana (now Guyana) remain forever. My favourite memory is my son aged 2 Waking up Christmas morning . I said “It’s Christmas darlin and Father Christmas has been “ He saw the presents on his bed shook from head to toe with excitement and was sick all over his gifts . Bless him.! He is 33 years old now but we still mention it EVERY Christmas since ! Mine was really simple, I always remember receiving a new nightdress from my Auntie every year. I couldn't wait to go to bed Christmas night and wear my new nightie, It was the best thing ever. Delightful Hamper, a lovely variety of Christmas goodies. It was wartime, and I was about 7 years old. Dad was away with the RAF, and we hadn't seen him for a long time, and then, one of my schoolfriends had told me there wasn't a Father Christmas! All of my letters to Father Christmas that had been sent up the chimney, had only asked for my Daddy to be sent home safely, so when he did return home from who knows where, on Christmas Eve, was my biggest and best present ever. So there was a Father Christmas, after all!!! Getting my Tiny Tears doll in 1968! Xmas morning when the kids were little opening their presents ,their little faces were a picture, never to be forgot. When my parents hid 3 bikes for my brothers and myself in the front room (we opened our presents in the back room) and my father told my older brother to go in front room and put some wood on the fire and light it he moaned "but it's Christmas day I'm opening my presents dad" "go and do it now" he said-then we heard the squeals of delight- we ran in and there were 3 shiny new bikes. We have a large artificial Christmas tree which I, on my own, decorate each year. My husband does all the heavy lifting from the attic but has no interest in the decorating so whilst I adore the tree when its all finished & lit up it makes me sad to do it alone. A few years ago after a short break for some winter sun my daughter-in- law & granddaughter picked us up from the airport. When we entered the house to our great delight the tree was up and looked so beautiful. I cannot explain the overwhelming feeling of happiness & gratitude I felt. To know that my son & his wonderful family had taken the time out of their very busy lives to do this for us brought us such joy. It was a real gift of love that Christmas time that we will never forget. Growing up in the North of England in the 70s i remember the power going off around this time so the family spent the evenings playing scrabble by candlelight in front of an open fire... despite the inconvenience the flickering light reflecting off the decorations was very atmospheric. 20p wrapped up inside Grandmas Christmas Pudding with Brandy sauce!! My first Christmas with my daughter opening her presents with help and loving the wrapping paper more then the present. Our Labrador retriever, Fry stealing and eating our entire cheese selection on Christmas Day and us forgiving him because we loved him so much. He showed no remorse. Going to midnight Mass in the dark for the first time at the age of 12. My favourite memory is waking up early on Christmas morning to find a pillowcase full of presents. It always included an annual such a Mandy or Bunty which I could read until mum and dad got up. Being Mary in the Nativity play at school and wacking Joseph because he forgot his lines! Making mince pies with my nan. My favourite Christmas memory is of our son opening his presents when he was 5. He loved Batman at the time and we got him a Batman-themed bike - his first bike - and his face lit up the room as he shook with excitement upon removing the wrapping! My favourite Christmas memory was when I was a child in the 1960's and visiting Santas Grotto in Blacklers Liverpool with my mum and my nan. In the store they had the biggest rocking horse I have ever seen, to me then it looked the size of a real horse and was jet black in colour with a set of steps to climb up to get on it. We used to visit each year when I was younger and riding that rocking horse was the highlight of my Christmasses back then. Gold adorned elephants and charmed cobras in war time Ceylon ! Lovely prize would love to win!! Favourite and actually funniest memory, when I was 14, I was invited to my best friends house for Christmas, her mum was ever so posh as they used to say. They had the biggest turkey I had ever seen. Her mum was doing 3 different roast meats for all the family who had just arrived from Shetland for the holiday. The aunts and uncles were all upstairs changing for dinner. As each of the cooked meats were taken out of the oven, they were each on their own very fancy vintage meat dish while they cooled down. About 30 minutes later we were all sitting down around the table, the beef and gammon taking pride of place, then in her dad walked with the 'turkey' full of apologies, it was slightly over cooked and had fell apart as he had taken it out of the oven! i didn't have any turkey for my dinner lol and I always remember that day as I cook my own Christmas dinners. My favourite Christmas memory is getting so excited as a child with my cousins hearing bells jingling and then Santa would appear. It was absolutely magical. It's just a shame our Grandad always had to run an errand and never got to see Santa. I recall everything stopping for Christmas day - no transport, no shops, and everything was so quiet and peaceful. Every year, watching my kids (now in their twenties) fishing in their Christmas stocking for the satsuma they get every single year. It wouldn't be Christmas without it! Cooking my first Christmas lunch for 14 people, as my mother had a cast on her leg after dropping the frozen turkey on her foot getting it out of the freezer two days before! I remember on Christmas eve,when I was a kid, me and my brother where at our grandparents and we was all dancing around to Christmas songs. The first Christmas my husband and I spent together, before children, we didn't have much except each other. We had a bacon sandwich (always a treat) for breakfast and chicken portions for dinner followed by home made jam tarts, after dinner the giving of our presents was best though as we wrapped ourselves up for fun and this is a memory I'll treasure for ever. This year will be bitter sweet for me though, I will carry those precious memories alone as he passed away in May. Living on a farm the animals always came first, so getting up early with my Dad and going out to the barns to see how many lambs had been born during the night. Feeding and watering them and checking that all were ok then coming back into the warm to a lovely breakfast and then opening all the presents. I love this but don't have any memory. If I were to win that this would create a fantastic memory for my family. I visited a friend in Finland when I was a teenager. First Xmas away from family. My luggage got lost on flight. So my mum sent out another suitcase for me. When it finally arrived (the day before I was due to fly home) I opened the suitcase to find it full of Xmas presents. Was so kind and a nice memory. celebrating Christmas with my Family over in Ireland, we never got to go over much and have a massive family over there, As you can imagine the delight and many tears of all the familys coming together once a year Having an amazing catch up and lot's of cuddles with grandparents etc. I Cherish these memories. My favourite memory was getting my first bike without stabilisers. I was riding my bike up and down the street at 7am! I remember my mum and dad asking me to make them a cup of tea on Christmas morning (far too early) when I was a child, but they told me to not look under the tree. I can't believe I actually didn't, and I'm glad because that year I got a bike, and it was the best present ever. My favourite Christmas memory is my husband Kev, daughter Georgina and i waking up Christmas morning in Ronald MacDonald house in London (which is a house for families to stay in whilst their child is in hospital) and going into Guys hospital and discovering our 6 week old daughter Elle had finally come off her ventilator after being extremely poorly and then whilst Elles lovely surgeon spent christmas day eating a full christmas dinner in the middle of the ward with all the other families we were told we could take our baby home the following day. It was magical. Elle is now 16 years old, which is amazing considering we thought she would never come home from hospital as a baby. I will never forget that Christmas and how kind the nurses and consultants were. Christmasses were never happy times for me and even now at the age of 55 I still get very sad sometimes. However, even trying hard to enjoy christmases with my children, nothing melted my heart like seeing my grandchildren’s faces on Christmas Day. The joy and excitement of the occasion was like a whole new experience for me, even sitting around the table with the family enjoying Christmas dinner, I couldn’t take my eyes off them, there smiles filled my whole being with joy. One year my parents gave me a small present to open and inside was a single bicycle pedal. They’d bought me a bike but were stuck on how to present it so had hid it in their wardrobe and just given me the pedal as a surprise. It was a great gift to get.